Eyebrow tinting can be a game changer for those that struggle with thin eyebrows and lashes. A good portion of a personal makeup routine can take several minutes, and even then, many still do not have the results they want. When eyebrows are sparse, a person must spend time tweezing, brushing, and penciling, which is time-consuming and annoying. Wouldn’t it be nice if you could wake up and already have eyebrows like supermodel Cara Delevingne? The quickest and most logical answer to the problem of thin eyebrows is tinting. What could you accomplish with all the extra time? When you first get to our place, we will talk about your complexion, hair color, eye color, and the color of your hair’s root. Women that have a lighter complexion, like blondes and redheads, will typically make eyebrows and lashes two or more shades darker than roots on the head. For those that have darker hair, it's usually recommended to go a shade lighter. Black hair and black eyebrows can look harsh. Our team will help come up with the right color mixtures to make you look beautiful—just the way you want. We will brush a thick die over each eyebrow, which may seem a little scary, but do not be afraid. After about two minutes, our technicians will wipe away the dye, which reveals a very natural looking eyebrow color. The eyebrow tint will only color your eyebrows. It will not stain your skin. 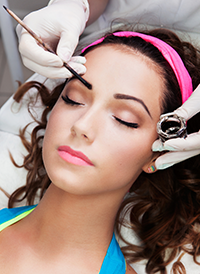 For more information about eyebrow tinting on Staten Island, you should not hesitate to call us. We also work do different types of hair removal on Staten Island.